a godly marriage, introduction, What is a Godly Marriage? 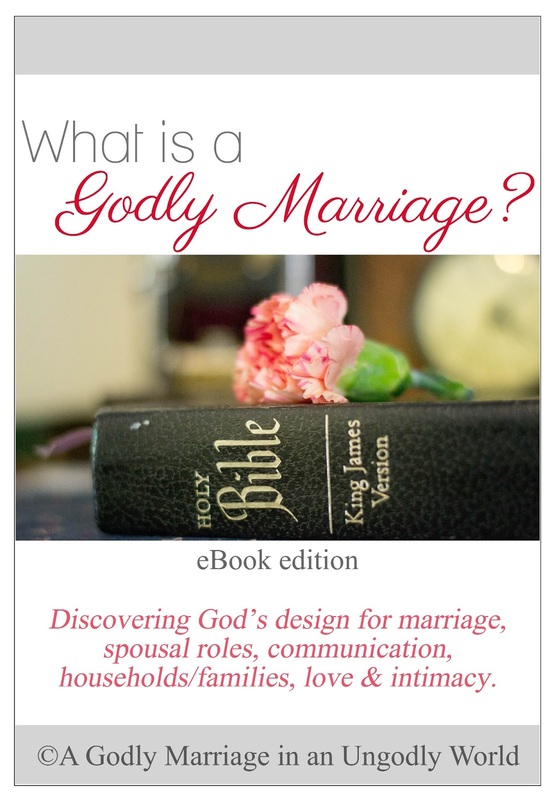 I have finally decided to create a mini series on the blog titled, "What is a Godly Marriage?" At the end of this series, I will offer it in eBook form in PDF format and possibly on Amazon as a Kindle eBook. I hope you enjoy it! I have a passion for marriage -- learning about it, talking about it, ‘being’ about it. But I am by no means a professional counselor or adviser. And by no means do I have the "perfect" marriage. I do what I do because I love doing it. You could say that I love talking about having a Christ centered marriage because I want my own marriage to be Christ centered 100% of the time. At one point, I didn't have that. But now that I do, I couldn't ask for a better life with my husband. I have learned so much in our marriage, and I have even learned much of what I know now from my husband. He is an inspiration to me and I am incredibly blessed to have him as the leader of our household. In 2011, I created a blog titled A Godly Marriage in an Ungodly World, simply because I wanted to share the things that God had placed on my heart in my own marriage. I began the blog anonymously and tend to keep it that way for the most part. Of course, friends and family caught on quickly because they know my writing style so well. But the strangest thing happened. I started receiving private facebook messages and emails from spouses in Christian marriages, thanking me for taking the time to share what God had laid on my heart – for challenging them to be a better husband or wife, even if their spouse isn’t interested in putting the effort into their marriage. At the beginning of this year, the A Godly Marriage blog’s facebook page hit 1,500 ‘likes’, and we are now well over 1,600 and still going strong. I am blown away and inspired by the way Christian spouses from all over the world are longing to keep and build their marriages on the firm foundation of our Lord. 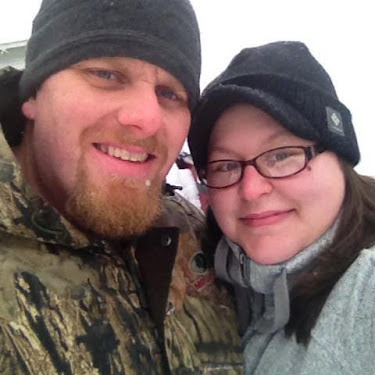 To be honest, at one point, I had lost hope in Christ centered marriages….but you have proven the statistics wrong! It is a constant struggle – a daily struggle -- to be the wife and Godly influence in my household that God has called each of us to be. Marriage is work -- as is any relationship -- but it doesn’t have to be hard. It’s like cleaning your house or your car. If you keep up with it every day and make cleaning habitual, your house or car will most likely be clean 95% of the time. It is easier to clean for a few minutes every single day versus neglecting your house and then becoming overwhelmed and angry with “cleaning” because you now have an entire week’s worth of clothes to fold and dishes to wash. The same is true about marriage. If we neglect to put any effort into our marriage every single day – to clean up our mistakes and iron out the little kinks – then these things will build up over time and become overwhelming. Unfortunately, many times, there are even strong Christians in our lives whose marriages end in painful divorce. But they don’t have to…. We can rebel against the statistics. We can make an individual change, even if we don’t see a change in our spouse. We can make the decision to say “this isn’t how the story ends”. During this seven part mini-series, I encourage you to open your heart and mind to what God has in store for your marriage as well as your own individual relationship with Him. Maybe you have an amazing marriage and simply want to refine it more. Or maybe you’re reading this, coming from a hurt filled and painful marriage, and you don’t think you have anything left within you to make it through. Either way, allow God to reveal His message to you – His will for a Christ centered household and marriage. And always keep in mind that even if your spouse isn’t upholding the vow and Godly role that they are supposed to, that is no excuse for you not to uphold your vow and practice your proper role as a Godly spouse. If at any time you are in an abusive marriage, please seek Godly counsel from your Pastor or a trusted elder in the church. No one, I repeat, no one deserves to be in an abusive relationship, especially if it is life threatening. I wish I had this for my marriage, I left my husband over a month ago after seven years of marriage, blended family problems, no communication, and we have a child together, my husband was mental abusive then I became physically abusive towards him, I moved out, because that wasn't me, I wanted to work things out, get counseling, had asked for forgiveness , my husband will not talk to me or call to check on our child together. I still love him, but I can't work on a marriage by myself, so I decided to let go and work on me and leave it up to God. I want his will to be done in this situation, Thank you for posting this. Please pray for me and my family to get through this tough time.